Fortune Jack is an independent poker site that only accepts crypto-currencies. Play real money poker instantly from the browser of your PC or Mac. No mobile app. Deposit and withdraw for free with Monero, BTC, Dash, Dogecoin, Litecoin & more. Hold'em, Omaha, 7 Card Stud cash games plus Sit & Go and Scheduled Tournaments. Rake is 4% at the cash tables. They do offer a generous loyalty program for regulars. Traffic is relatively low. Most players come from their popular bitcoin casino. Fortune Jack Poker is licensed and supervised by the Government of Curaçao. 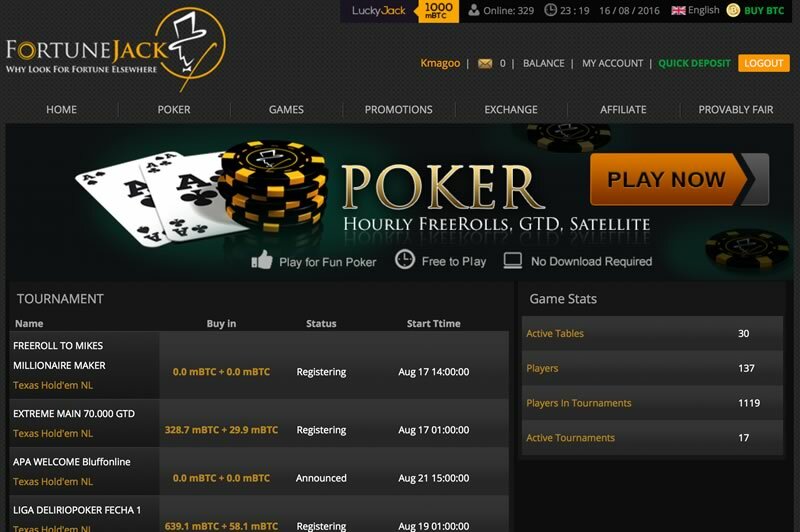 FortuneJack offer a 100% deposit bonus up to 0.5 BTC for new players. Fortune Jack is primarily known for being one of the world's most popular and trusted bitcoin casinos. 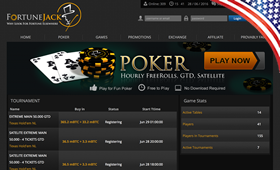 They've now branched into online poker with a feature rich client that supports both ring games and tournaments. Fortune Jacks gaming license is issued by the gaming commission of Curaҫao. Cash games start from as low as 0.32/0.64 mBTC and run as high as 8/16 mBTC, with play money tables also available to those wanting to learn the game without burning through their crypto. As well as the popular Hold ‘Em, you can also try your hand at other variants including Omaha and 7 Card Stud. There are also dozens of tournaments running each day: whether you like yourself a Freezeout, KO or Turbo tourney, there’s something for you on FortuneJack’s busy schedule. You can even take part in hourly freerolls where there is literally free BTC up for grabs. The site’s browser-based poker client is slick and smooth; graphically it is very pleasing, while the moveable bet slider, various buttons and customisable input make your poker experience extremely easy to execute. Additional features include: enable the four-colour deck to prevent any misreading of suits; play multiple tables at once and never wait for a hand again; write player notes if you’ve gathered any information on your opponents, and even recover your past hand histories to review your previous plays and develop your own strategy. The Fortune Jack client is Flash based so it's not going to work on iOS devices unless you have a Flash browser installed. Android users will be able to play on their tablet or smartphone providing Flash is enabled. Mobile poker fans should visit our Android and iPhone poker page for a list of the best poker apps. You can register for an account at FortuneJack in seconds – simply provide a username, password, email address and your country of residence. No email confirmation is necessary so you can start playing straigt away. Fortune Jack only require 1 deposit confirmation so you'll be at the real-money tables within minutes . The minimum amount you can deposit is just 1 mBTC and there is no maximum limit set. All transactions are processed free of charge. 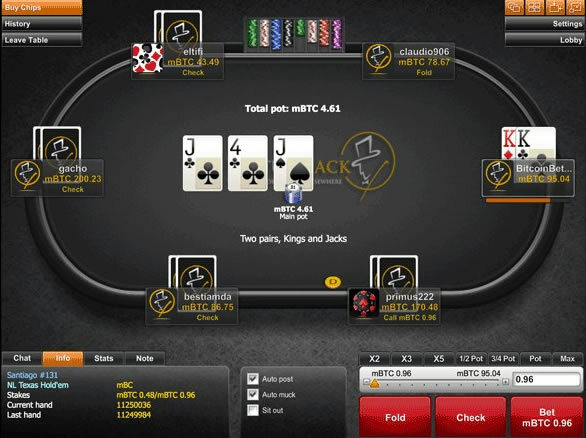 FortuneJack offers huge bonuses on a regular basis to its players: you will receive a 100% bonus on your first deposit on amounts up to 500 mBTC, and your loyalty will continue to be rewarded with a 100% monthly bonus on further deposits up to 1 BTC. You will also benefit from one of the most competitive reward schemes around; earn loyalty points by playing, advance through the VIP stages and use your points to redeem cash prizes and huge gift giveaways. Rake at the cash games is 4%. 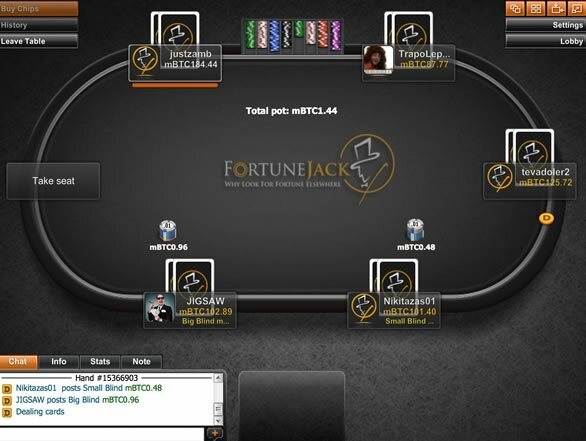 If you encounter any issues while using the FortuneJack poker client, the support team are available 24/7 and can be contacted via email at support@fortunejack.com. There is also a live chat feature on the homepage of the site which can be used if you are needing immediate help, and those of you keen on social media can even get in touch through Facebook or Twitter! ​Google’s two-factor authentication can be activated to increase the security of your account. Fortune Jack Poker is a well designed "Instant Play" poker client that is fun to play . Traffic is still low but thanks to the popularity of their online casino you will always find plenty of action at the lower stakes tables. 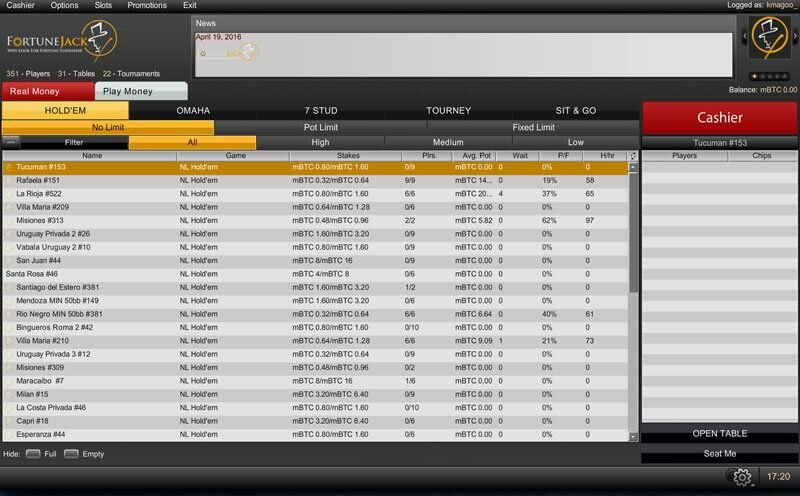 A HTML5 web-app for iOS and Android would be a welcome addition for those looking to play mobile poker. Overall it's a solid effort and one that is sure to improve over time.